A pair of fans or morchals formed of peacock feathers fixed to handles made of enamelled gold. Some of the peacock-feathers are embellished with seed pearls, turquoises and gold embroidery. The handles are decorated with multi-coloured enamelling depicting peacocks and flowers and inlaid with diamonds. Fans such as these were part of the paraphernalia of Indian court, where they were held by court attendants to fan the ruler or dignitary. 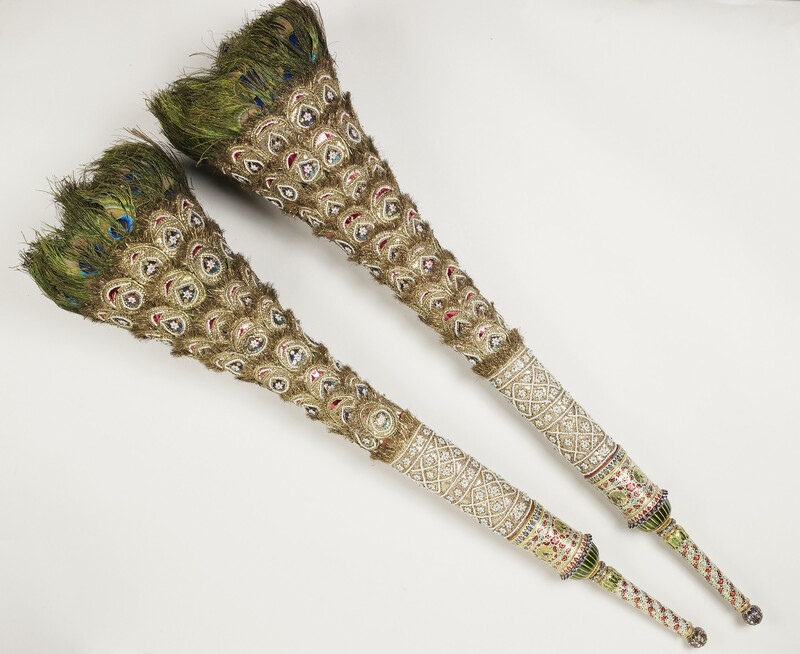 They were designed to be conspicuous and used luxurious materials such as diamonds, pearls, gold and peacock feathers, to enhance the spectacle of court. The style of enamelling used for the handles is iconic of Jaipur, in Rajasthan.